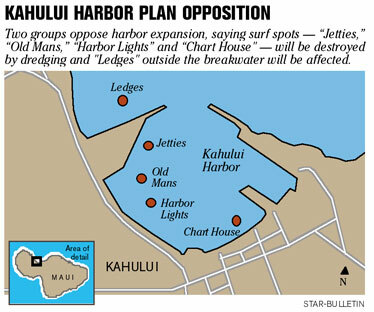 WAILUKU » Two organizations say they are opposed to a state plan to expand Kahului Harbor that would eliminate or affect several surfing sites. Jan Roberson, chairwoman of Surfrider's Maui Chapter, said the surfing sites proposed for elimination by the state are located on the west side of Kahului Harbor. The surfing sites that would be eliminated by dredging in the harbor include "Jetties," "Old Mans," "Harbor Lights" and "Chart House." Roberson said the plan will alter a surfing site on the Waiehu side of the Kahului breakwater called "Ledges." The fifth and final contest of the United States Bodyboarding Association's National Championship Tour for 2007 was held at Ledges. "We're going to be opposing this," Roberson said. "We're mounting a big opposition." Roberson said the proposed expansion of commercial harbor activity planned by the state was "troubling." "This break is the playground for our local Kahului kids," Chun said. "We believe that very few on Maui would vote to have cruise ships over the surf break." A draft environmental impact statement for the State 2030 Master Plan for Kahului Harbor said expansion of the harbor will require dredging, affecting 22 percent of the coral and leading to the loss or relocation of recreational activities such as surfing. The 2030 Master Plan for Kahului Harbor, the busiest neighbor island harbor, proposes a new west harbor breakwater, a ferry/barge slip and a harbor cruise terminal. State transportation officials are scheduled to hold a public meeting Wednesday to receive public testimony about the draft. The meeting starts at 6 p.m. at the Cameron Center.